*Take 25% off your entire order. 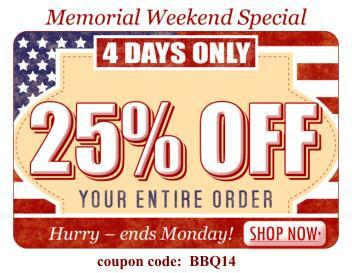 * Use promotion code BBQ14 when you check out. * The sale ends May 26, 2014 at 9:00 p.m. pacific time. * ALL “BBQ14” SALES ARE FINAL. * NO RETURNS ACCEPTED, NO REFUNDS WILL BE GIVEN. Make sure to check out our clearance department for super savings. There are hundreds of items already reduced. The coupon can also be used on our sale and clearance items for additional savings.